Oops...almost forgot again! 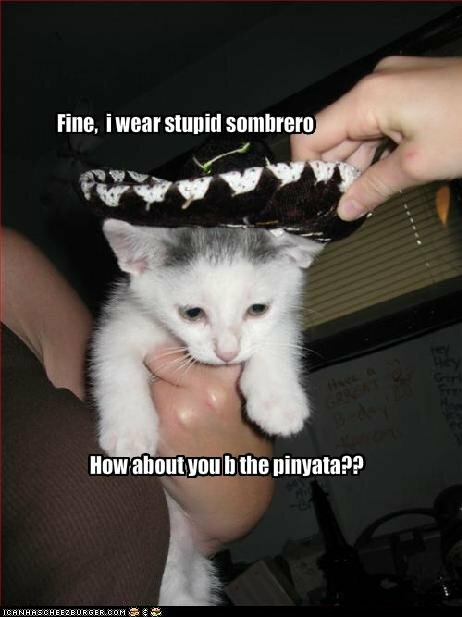 I realize Cinco de Mayo was yesterday, but I'm posting this pic anyway in honor of it! Enjoy! I just saw this on Alexia's Books and HAD to come over and check out your blog! 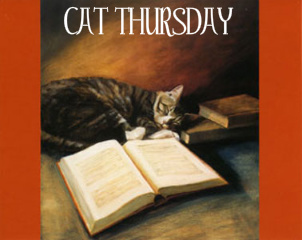 Starting next Thursday, you can count on me to participate in Cat Thursdays! And now I am a new follower! I look forward to reading your posts! It appears we share the love of books AND the love of cats! Please feel free to check out my blog, too, and consider becoming a follower in return...I've only been blogging for a month and am slowly building up my followers...once I get 50 followers on Google Friend Connect I plan on having a celebratory book giveaway contest! Haha--why do people dress their cats? !